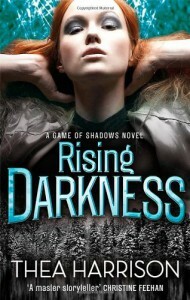 RISING DARKNESS by Thea Harrison is the first book the GAME OF SHADOWS series. 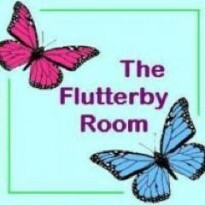 It tells the story of Mary, an ER doctor whose life is pretty ordinary apart from her dreams. Then her path crosses Michael’s, and everything changes. RISING DARKNESS is a really interesting and enthralling read, but to be honest I don’t quite know what to make of it. Harrison does a brilliant job with an intriguing plotline and captivating characters. There are also occasional references which hint at things, which I found both fascinating and frustrating. I wouldn’t like to take a guess where the next book in this series goes. Mary is a really great main character. I liked the fact that she is very sure of herself even when things aren’t going her way. I also liked the sense that she was a very caring person and that she knew her own limitations. Michael on the other hand is quite a reserved character. He also has a strong sense of self. It was interesting seeing Mary and Michael interact, especially with the history that neither of them was really sure of. The plot of the book is quite a complicated one, and after reading it I am definitely left with questions I would like answered. I think Harrison does a good job in introducing the main characters and ideas for the series overall in this book. Just focusing on the book itself Harrison managed to have what felt like a complete plotline. If you’ve read any of Thea Harrison’s pervious series then you should enjoy this one, although RISING DARKNESS moves away from the fantasy element to the paranormal romance of her ELDER RACES series – there’s almost a sci-fi feel to it. If you are a paranormal romance fan and enjoy something with plot as well as romance then you should definitely consider this book and series.